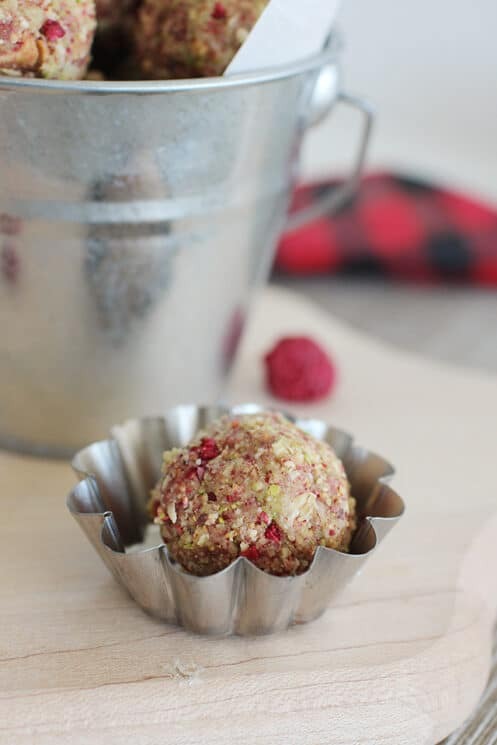 Little bites of tasty goodness, these Holiday Energy Bites are a great choice to keep you and your little ones going during this busy time of year! 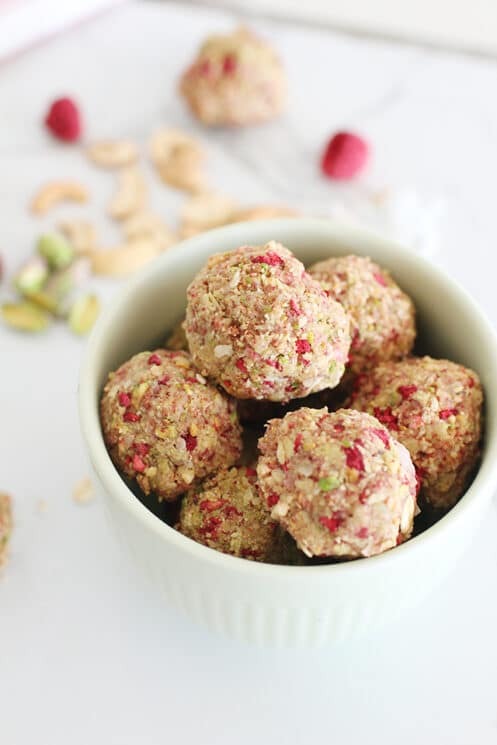 Energy bites are one of the easiest snacks to make because there is no cooking involved! All you have to do is throw the ingredients into your food processor, pulse a few times and done! 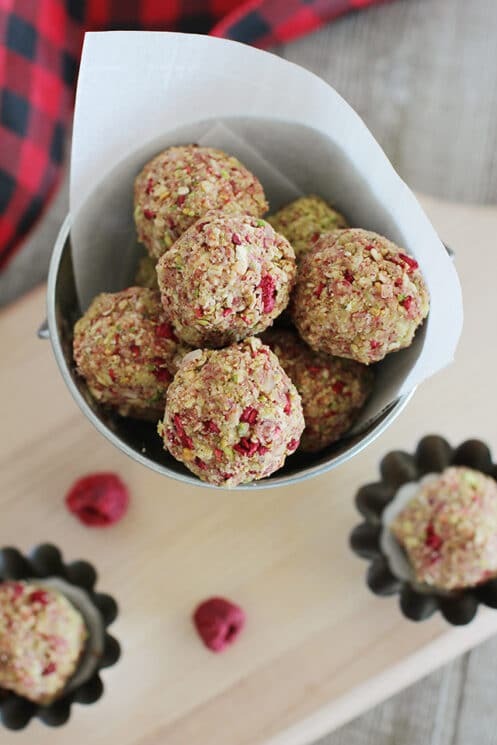 For these Holiday Energy Bites, some of the ingredients are super delicate – the raspberries. 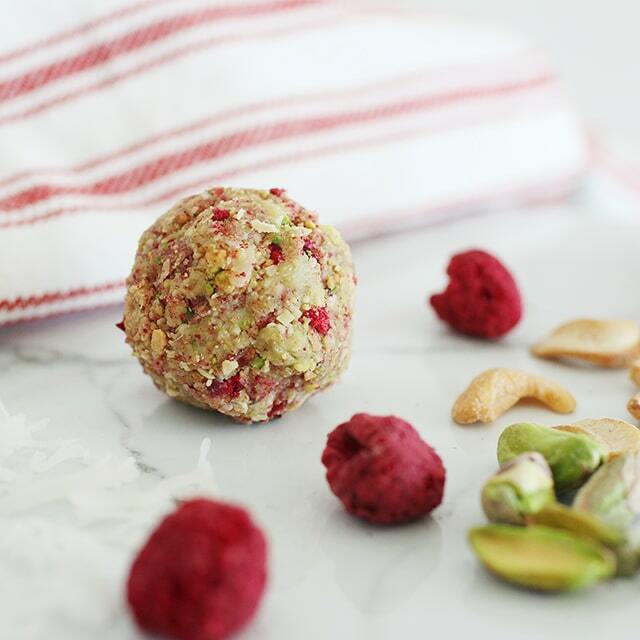 We recommend using freeze-dried because they add a bit of a tart flavor and beautiful color. But you will want to add them last after everything else is combined. After you shape the mixture into ball shapes, chill your bites in the fridge for about 15 minutes before eating. Include 2 or more food groups in a snack, including a fruit or veggie. Most kids don’t eat the recommended about of fruits and veggies every day. Snacks are a great way to increase fruit and veggies in your kids diet. We like to pair them up with a protein food or whole grain to make it a little more substantial. Avoid processed foods. These types of foods usually have a lot of added sugar and salt and don’t have many nutrients. Your kids will likely feel hungry faster after eating a processed food snack versus a snack made with whole foods. Have a few pre-made snacks on hand. When your kids feel like eating a snack or say they are ‘staaaaarving’ they won’t want to wait even 10 minutes for you to whip something up. 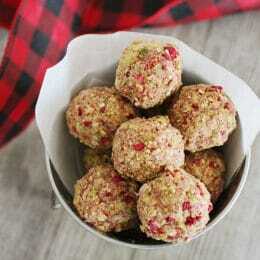 We like having something like these energy bites on hand, so your kids can just grab one when a snack attack hits. Add the nuts, coconut, oats, coconut oil, and honey to a blender or food processor. Blend together by pulsing, until mixture becomes sticky. Add raspberries and pulse to gently combine without breaking down completely. Shape into 1-inch balls. Chill for 15-20 minutes before serving. 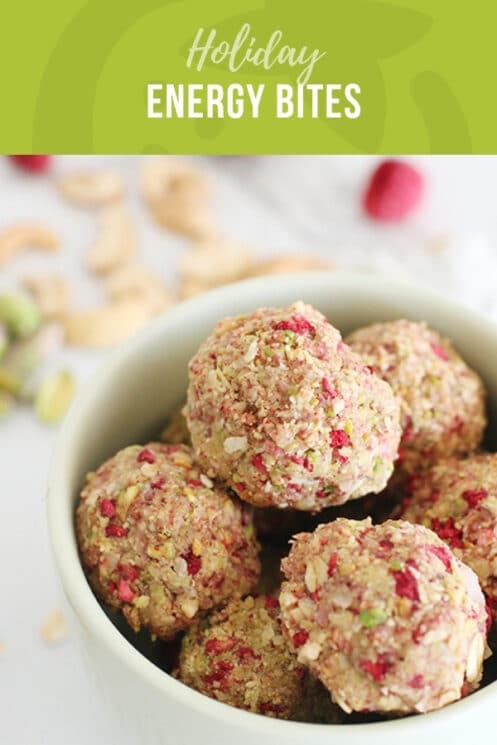 Would love to make these but my little one is allergic to cashews. What could I use instead?